Uncertainty looms large over the expected key civil aviation policies and decisions of the National Democratic Alliance (NDA) government. The sector is waiting for the government to take decisive steps on aviation policy, new flying abroad rules and route dispersal guidelines. The draft rule for airlines to fly abroad, scrapping the incumbent 5/20 rule, was unanimously opposed by sector players. At present, airlines need five years of flying experience, along with at least 20 aircraft, to fly to international destinations. The government decided to replace it with a credit-based system, linked with route dispersal guidelines. After sending the proposal for inter-ministerial consultation, the government reportedly formed a committee to look into the ministry's proposals. While incumbent airlines are opposed to the idea, new ones are unhappy with the linking of international flying norms with the requirement of flying in regional domestic zones. As for the government's plan to privatise the Chennai, Kolkata, Ahmedabad and Jaipur airports, labour-related issues have halted work. Employees of the Airports Authority of India (AAI) have opposed the move and the deadline to submit the Request For Qualification for the bidders was extended to May 26. After coming to power, the government had also promised low-cost airports. But it decided to put on hold the development of 50 low-cost ones in non-metros, citing "lack of commercial viability". A new criterion has been mooted in this regard, which says the minimum population for a place to have a low-cost airport would be fixed at one million. However, work will continue on low-cost airports where construction has been sanctioned - Karnataka, Rajasthan, Arunachal Pradesh and Odisha. Another plan of the government was to list AAI after hiving off Air Navigation Services (ANS) as an independent company. However, the draft Bill has not been finalised. According to sources, AAI employees are likely to object to this, too. The only significant development has been upgradation of India's air safety rating by the US Federal Aviation Administration (FAA). In January last year, FAA had downgraded India to Category-II, implying safety oversight in the country did not comply with the International Civil Aviation Organization's standards. In March, FAA officials had visited India to assess air safety measures and found it to be compliant with international standards. 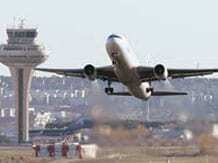 Experts have expressed disappointment at the lack of action by the government in the civil aviation sector. "Many in the sector feel the Modi government deserves a low two out of 10 in developing the aviation sector. These marks are actually for ending the year with no major scams," said Amber Dubey, partner and India head of aerospace and defence at global consultancy KPMG, adding a commitment from Prime Minister Narendra Modi himself was required for a robust growth. "Then comes long-pending reforms like the abolition of route dispersal guidelines and the illogical 5/20 rule; reduction in jet fuel prices; abolition of taxes on aircraft maintenance; immediate creation of the Essential Air Services Fund for providing seat subsidy for regional airports. DGCA (Directorate General of Civil Aviation) needs to undergo a complete overhaul."